My sister Linda invited me to a movie today, which is always a “yes” from me! We settled into the theater for a matinee viewing of Kingsman: The Secret Service. This action adventure film stars Colin Firth, Michael Caine, Samuel L Jackson, Mark Strong, Taron Egerton, Sofia Boutella and Sophie Cookson, with a brief appearance by Mark Hamill as Professor Arnold. 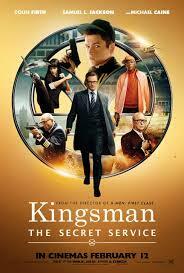 It is directed by Matthew Vaughn and adapted from the comic book “The Secret Service” by Mark Millar and Dave Gibbons. Kingsman has a run time of 2 hours and 9 minutes and is rated R for language, violence and brief sexual content. Kingsman: The Secret Service tells the story of a British super-spy organization intent on recruiting a new person into the elite circle. Dapper Harry Hart (Firth), codename Galahad, and the other Kingsmen, go on alert when an agent is killed during a rescue attempt. Techie billionaire Richmond Valentine (Jackson) and his assailant partner Gazalle (Boutella) are the villains behind a series of kidnappings that targets heads of state and VIPs, some of whom disappear while others reappear with a device implanted behind the ear. Hart brings to the recruitment program a young man, intelligent and capable, but adrift, headed for a life of crime and imprisonment. Gary “Eggsy” Unwin (Egerton) is the son of another recruit who died 17 years earlier while training with Hart. Rescuing the son is Hart’s way of making up for the father’s sacrifice. 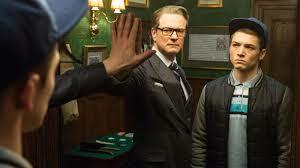 Overseen by the Kingsman leader, Arthur (Caine), and under the training of senior Kingsman, Merlin (Smart), Eggsy and the other candidates for the program undergo a series of strenuous and challenging tests, narrowing the field of potential Kingsmen down to Eggsy and female candidate, Roxy (Cookson). Roxy is selected. But a devious master plot emerges. Valentine and Gazalle, seeing the population of the earth as a “virus” that will ultimately destroy the planet, develop a plan to eliminate most of the inhabitants. Valentine gives away SIM cards for cell phones, granting free cell phone and internet use. Millions take advantage of his seemingly generous offer. The SIM cards can be activated by Valentine, causing people to become uncontrollably violent. A test run at a church in Kentucky results in the members of the congregation killing each other. Valentine intends to activate the signal on a global level, allowing those that he considers “lesser” to destroy each other, while he preserves a small group of people who will then govern the world. When this plot is uncovered, Merlin, Eggsy, and Roxy join together to save most of mankind from annihilation. This was a FUN movie! I was surprised by the comedic element. This was a tongue in cheek tribute to the Bond movies and other spy type movies and TV series such as Man from U.N.C.L.E. and The Avengers. The men in the Kingsman organization were gentlemen and followed a code that included such gems as “A gentleman is always on target with witty remarks, interesting facts, and conversation starters that bring the best out of everyone.” Make no mistake though, these well dressed gentleman were highly trained in combative maneuvers and employed an arsenal of secret weapons, from umbrella rifles to shoes with hidden blades and grenades disguised as cigarette lighters. In a very Get Smart way, the Kingsmen used a tailor’s shop as a front for their organization. Each agent was carefully fitted for superb, stylish clothing that also happened to be bullet proof. I loved watching young Eggsy transform from a down on life, street wise kid to a Kingsman. Hart taught him this vital truth from Ernest Hemmingway: “There is nothing noble in being superior to your fellow man; true nobility is being superior to your former self.” Eggsy learns who he is and steps up into that space, becoming a team player when necessary, and striking out on his own when that is the action needed. Actor Taron Egerton delivered a cheeky, fresh performance. Colin Firth is always a joy to watch, and from my research, did 80% of his own stunts. And Samuel L Jackson, as a villain with a lisp who throws up at the sight of blood, brought humor to what could have been some gruesome scenes. In fact, humor showed up unexpectedly several times, all with the purpose of lightening scenes that would have weighed heavily otherwise. I also enjoyed the references to the Bond movies, and the nod to King Arthur and his Knights by using names from that tale for the Kingsmen codenames. This was a lively romp of a movie, with undertones of nostalgia for one who grew up watching spy movies and TV shows. I sincerely hope they make a sequel!